Sébastien Erard (1752-1831) was a successful piano manufacturer and inventor of several important patents such as the "double escapement" action which allows notes to be repeated more easily than in single actions. 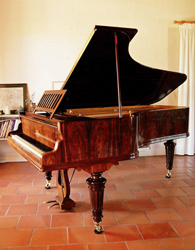 Virtually all of his major innovations are still today retained in modern piano design. During his early career in Paris, he produced harpsichords and pianofortes for the French Court. After the revolution, he continued his piano manufacturing in London and let family members operate the production there when he returned to Paris a few years later. There he continued improving the design and manufacturing techniques of the pianoforte until his death in 1831. Nephew Pierre Erard (1796-1855) took over the production and continued development. He enjoyed great success when he set up endorsement deals with celebrities and musicians at the time, such as Queen Victoria, Franz Liszt and Felix Mendelssohn. The Erard pianos where then marketed as the finest pianos in the world and by 1850 considered the king of the concert hall. After that, no further developments were made except some slighter construction improvements. In the early 20th Century, musical taste changed in favour of the more modern "harsh" tone. Erard's instruments began to be perceived as outdated and old fashion. However, several famous musicians of the time were apparent Erard owners - Maurice Ravel, Gabriel Fauré, Ignace Paderewski among others. The physically modelled virtual copy for Pianoteq of piano Sébastien Erard is a half grand (2 m) with serial number 109 933 (1922). It has an extraordinary warm and coloured sound with lots of charm, and is equipped with a very delicate una corda pedal. We tried to be as close as possible to the original instrument, including some small "defaults" in the bass strings.